The Flobble toys and puppets were designed and built by Karen Valleau and Kit Pasold helped us out with the shoot. You can find out more about the Flobbles – all 7 of them – at the Official Flobbles Website. It’s a little – odd – I’ll admit but we had fun doing it. Sorta like an episode of Lidsville directed by Roger Corman. Sort of. Kinda. There’s a longer Director’s Cut which we’ll get around to posting someday. In the meantime … smoke ’em if you got ’em. P.S. I also made up a movie poster for Jill to print out and put on her wall. Goofy silly fun for all involved. Thanks, jill! 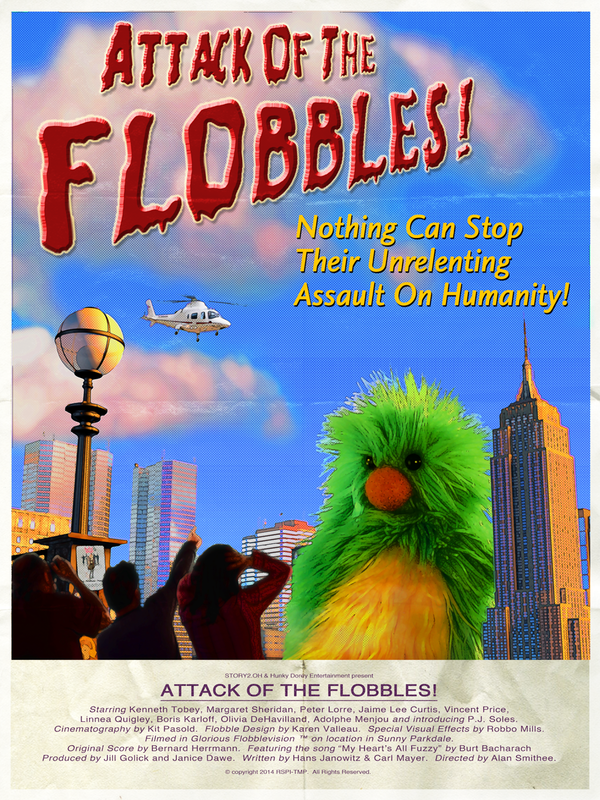 February 18, 2015 | Filed under Uncategorized and tagged with Attack Of The Flobbles, cbc, children, comedy, flobbles, jill golick, karen valleau, kit pasold, lidsville, puppets, roger corman, ruby skye p.i., SF, smoke em if you've got em, video, web series.